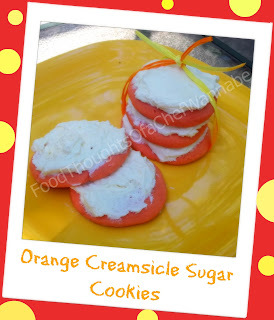 FoodThoughtsOfaChefWannabe: Orange Creamsicle Sugar Cookies! Hello!! I hope this finds you all healthy, happy and maybe even your kids back in school? I can remember when Cody would start back, which is when I did as well, since I am/was a teacher/full time substitute. I am a girl who enjoys routine. Not in a bad, I can never be spontaneous way but in a, I like routine way. Yea, like that! Anyway blessings to you all and your children for a successful school year full of learning, success, personal growth and fun! That being said, it is almost time for afterschool snacks! I always had cookies baked or made into ice cream sandwiches in the freezer. I also always had a huge pitcher of kool-aid in the fridge. My sons friends knew me as the cookie and kool-aid mom. I would often make what we called garbage cookies, which was nothing more than sugar cookie dough and anything we could find, ends of bags of choc or any flavored chips, candies, nuts, marshmallows, anything! Sugar cookies have always been a source of happiness for me. Remember how I always say in my family everyone has their "thing" they cook or bake well? Well, for my sister Peg #2 (of 10) it has been sugar cookies. This woman can put out the most incredibly soft, sweet, heaven in your mouth sugar cookies you have ever tasted. Then, she tops them them with this frosting, a frosting definitly worthy of topping her famous, heavenly sugar cookies! She rolls them thick and they are never hard. I don't like hard crunchy cookies myself. The point to this whole blog is that I never have been privy to this recipe until now! My sister lives in Cincinati and she misses me so much (haha) that she gave up her ultimate sugar cookie recipe. Can you believe I went and CHANGED it?!?! I did. I will make notes of what I changed so that you can omit anything in ORANGE for a regular sugar cookie. I also, FYI, rolled them in balls and then using my palm or the bottom of a glass pressed them down to the thickness I wanted. If you roll these out in the traditional way, you will get a few more cookies than the 21 I got from this recipe. Also for the frosting if the egg whites uncooked bother you, use the ones from the store. This is my new standby frosting, this and to decorate swiss meringue buttercream! I have icing left, but you likely won't if you roll them out smaller or roll them out and use cookie cutters! Mix all ingredients until combined. Chill for 2-3 hours. Roll out as thick or as thin as youw ant. Bake 7-8 minutes at 350 degrees. Let cool completely before frosting! Whip together until silky smooth and frost cookies! I hope you enjoy these lovely, orange cookies with the most delicious vanilla frosting! They freeze great and would make great sandwich cookies too!! P.S. Do you like your cookies hard and crunchy of soft and chewy?! Leave me a comment below and tell me! Would high altitude adjustments need to be made to this recipe? Linda, I am not sure. Let me ask one of my REAL baker friends and get back to you. If you make adjustments for other cookies recipes you might want to make them for this as well. Hold tight my friend and I will get you an answer! Thank you for your comment! 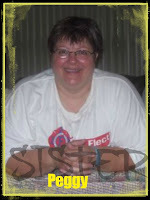 Linda can you message me here or on FB and let me know what state you are in? This chart should help, it is the best I can do!! I am in the Soft and Chewy camp on cookies!! I can't wait to try this recipe Orange Creamsicle is one of my favorite ice cream flavors! Me too!! Thanks for the comment! Can't wait to see how you like them! Jessica, try UNDERbaking your cookies by 1=2 minutes. Let them sit on the pan until cooled. The heat will carry over cook them and they should be perfect and soft!